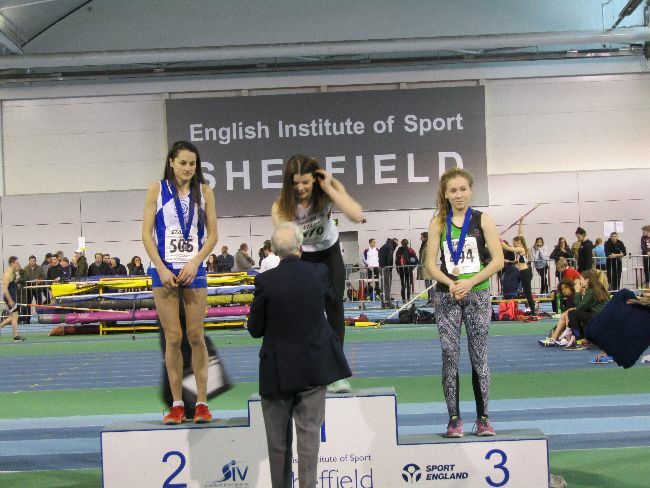 Strong performances all round for Nene Valley Athletes last weekend at various indoor events. On the same time as the cross country athletes were competing in the Schools County Championships at Ely and Burghley Park and the North Midlands League at Nottingham, a number of our athletes also attended the North of England Indoor Athletics Championships at Sheffield and the South of England Indoor Athletics Championships at Lee Valley. The weekend was very successful, and demonstrated that although the top end of our sport may be in some turmoil the sport is as exciting as ever at club level. Hannah Molyneaux, the understated teenager has added another gold medal to her collection. 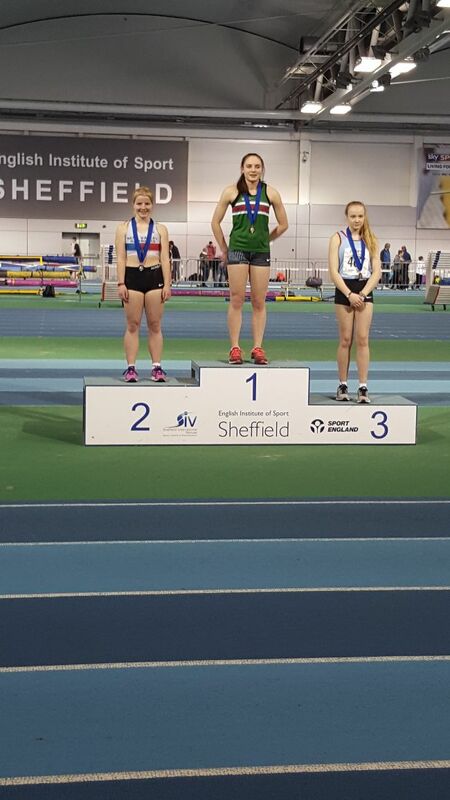 Hannah, competing in Sheffield on Sunday threw the under 17 shot putt a massive 14.38m to win the event with a Championship Best Performance. Needless to say this was a club record and personal best for Hannah. 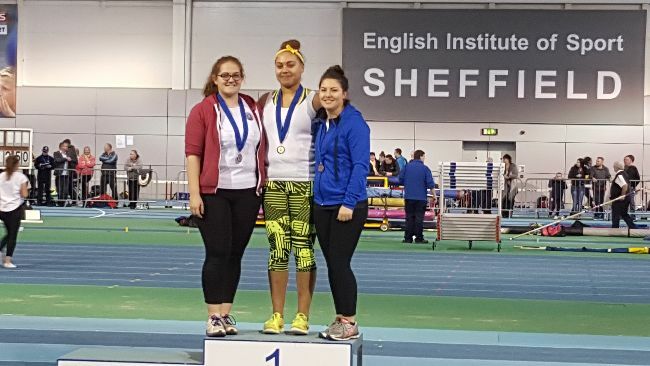 Hannah will be eligible to join our senior team in the Southern Athletics League in the summer and our ladies shot putt should be strong with Becki Hall also winning a bronze medal in the senior ladies shot on Saturday. He putt of 12.32m, despite her sore achilles tendon was good performance and only slightly shorter than the 12.66m she threw at Loughborough last weekend. Our other gold medallist also broke her own personal best and the club record. 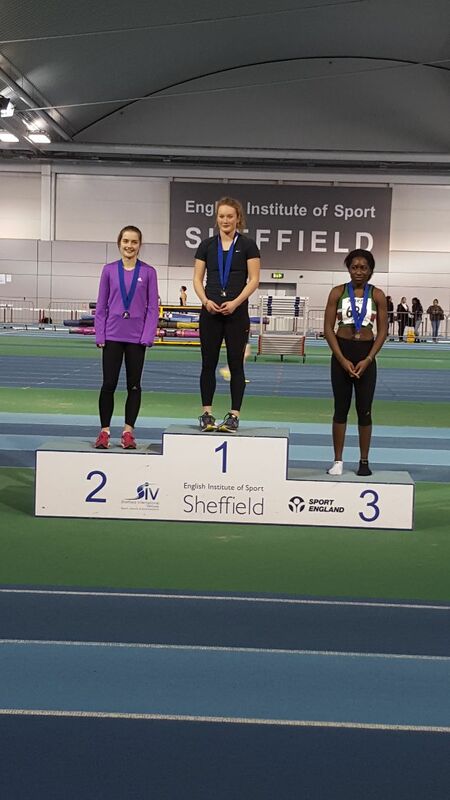 Lily Hughes continues to get quicker with an impressive 7.75s win in the under 20 ladies 60m. Lily won her heat (3rd fastest overall) and semi-final with times of 7.87s and 7.79 before running marginally quicker in the final. Although she started slowly she took the lead within 30m and never looked back. To complete the collection of medals for the club on Saturday, the ever cheerful Rosie Fresen took a very good silver medal in the under 17 paddies pole vault. Only start6ing her third year of vaulting Rosie, like Lily started the competition slowly having to adjust her run up slightly as she failed the first couple of heights on her first attempts. She soon settled down and when she cleared the 3.10m mark by a large margin she really looked as if she was going to progress to new heights. Again she cleared the 3.15m bar comfortably, equalling her own personal best and setting a new club indoor record. Unfortunately she was unable to progress further as tiredness and nerves returned which may have results form the lack of vaulting possible in recent weeks due to the weather but she did take the silver medal for her endeavours. James McCrae was our other medallist for the weekend, competing in the Midlands Counties Indoor Championships also run in Sheffield. He took gold medal in the under 20 men's 800m with a time of 1.58.79 with a last gasp dip on the line taking the medal by just 2 one hundredths of a second. This was an impressive performance considering he had just taken the North Midlands League Cross Country title in Nottingham just the day before. The sport is not only about the medal winners, Jasmine Allen produced a remarkable performance in her first competition as an under 17 athlete. She had to go through the pool system to qualify for the final and did so jumping a personal best indoors of 4.91m twice in the three attempts. She then went a step further in the final, having qualified in twelve place she jumped a new indoor best of 4.99 three time sin the six attempts and also recorded 4.69 twice. overall a remarkable performance, no foul jumps in nine attempts and only recording 5 different distances, consistency at its best. Jas had not been aware that she had qualified for the long jump final when she competed in her 60m heat and ran a personal best of 8.37 finishing the race and going straight across from the line to compete in the long jump final. She had also been aware that she had managed to qualify for the 60m semi-final and therefore literally made her last jump before going to call up for her 60m semi-final where she showed good strength of character to finish in 8.43s, sixteenth overall. Sean Garmory arrived at the event with his Newcastle University team mates having missed most of the Christmas holidays with a hamstring injury incurred in his last session at University before the break. Although not running a smoothly as normal he smashed his indoor personal best for 400m recording a heat time of 53.28 just marginally off his outdoor best. Beth Denial was also out producing a personal indoor best over the 60m hurdles recording a time of 10.24 in her under 20 ladies heat. Shortly afterwards she also competed in the long jump recording a jump of 4.95m in the long jump giving her fifth place. Whilst the above were competing in the Northern Championships, a few had also attended the Southern version at Lee Valley. Georgie Ivens continued her comeback from a serious injury and finished fourth in the senior ladies 400m with a time of 57.2s. The final had been just 40 minutes after her heat and she faced athletes all of whom had run for GB at some time during their careers and despite this she missed out on bronze by three or four strides. Callum Crosby competed in a tight under 20 men's 60m. This was his first under 20 event and his time of 7.42s was a personal best. His start had been slow due to being unsettled by a faulty start when the starters gun misfired. He came back into the race well but this short event doesn't allow enough time to make the gaps up again. Also competing in the under 20 ladies 200m was Tash Segal who recorded a time of to finish fourth. ( I will find this out as do not have it yet). Well done to all the above.